Don't Miss the Beautiful, Shiny, Sparkly, Fun Stuff!!! I implore you to consider whether this may be the right opportunity for you to Become a Stampin' Up! Demonstrator. And I want to point out that with your Starter Kit you will get ALL that beautiful, shiny, sparkly, fun stuff in the video (and access online as a demonstrator to MUCH, MUCH more) and there is no further obligation whatsoever after you purchase the kit. What that means to you is, worst case scenario, you give yourself the gift of over $225 in Stampin' Up! product and supplies, for only $99! And don't forget, if some of those sparklies are not your favorites, you CAN substitute similar sparkly items at equal or lesser values for many of them. Imagine going to the craft store and spending $99, then watching in awe as they pack over $225 in merchandise into your shopping bags. How freakishly excited would YOU be?!? But wait, there's more--this is not just about the merchandise...your Starter Kit gives you the opportunity for new lifetime experiences. Demonstrators tell me that the relationships, and the sharing, and the getting together and enjoying creativity are the most fulfilling things about Becoming a Stampin' Up! Demonstrator. You can't put a price tag on making those kinds of memories--but if you could, you know it would be WAY higher than just $99. And by the way, this is not just selfishly spending $99 on you, because Stampin' Up! will touch the lives of everyone that you share it with. I can't tell you how it will specifically touch your life, but it has created tremendous opportunities for personal growth and change for me. I could go on and on about this subject, but I need to close this blog post, so if you'd like to hear more about how Stampin' Up! changed my life, you are welcome to email me. I'd also love to chat about you, if you'd allow me that privilege, so I can support you in getting what you'd like to get out of your demonstratorship. 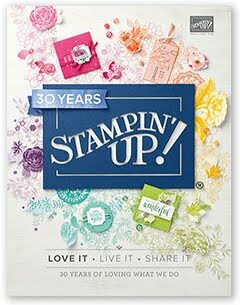 So, if this is the right time for you, Become a Stampin' Up! Demonstrator for yourself and for what it will bring to your life, and also for what it will allow you to share with others :-) REMEMBER: This $99 Starter Kit offer is good ONLY through 11:50pm MT on July 31st!!! click image to sign up now! 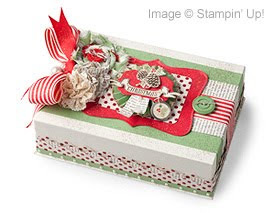 Okay, so there's a FABULOUS promotion going on during July...you can Join Stampin' Up! during July for only $99!!! (Click Image Above to Join NOW) NOTE: Your Starter Kit can be customized--items pictured above are recommended, but a new demonstrator can substitute a similar item of equal or lesser value. The Starter Kit also includes Business supplies (not pictured), but those cannot be modified. 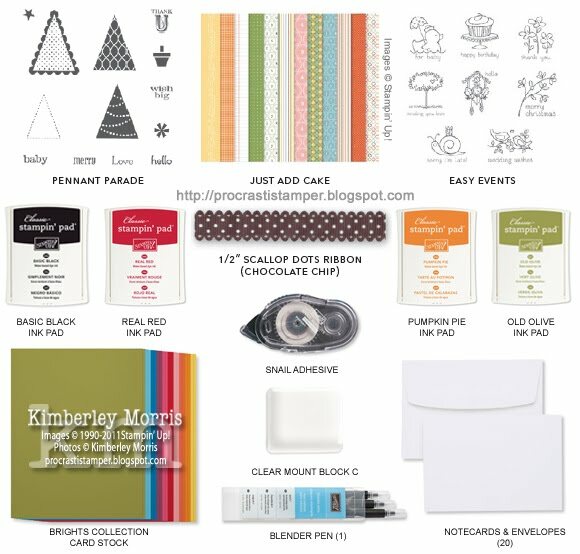 The FREE Keepsake Box Project supplies include: Pines & Poinsettias wood-mount stamp set*, Keepsake Box, and pieces of Holly Berry Designer Series Paper, Designer Fabric and Designer Buttons*, and all other paper products and embellishments needed. There are a few small tools you'll want to use which are not in the kit--but you can come over to my place and use mine :-) *Stamp set & Holly Berry products are from upcoming 2011-12 Holiday Mini. If you've been wanting to become a Stampin' Up! Demonstrator, NOW IS THE TIME! Your kit will contain new catalogs, and all the supplies you'll need to hold several Workshops, so it's easy to earn back your Starter Kit investment! I can help you design your Workshop cards and demonstration, so don't worry, no training or experience is needed. Stampin' Supplies: Flower Fest stamp set, Occasions Alphabet stamp set, Box #2 Die, Whisper White card stock, Wisteria Wonder ink & ruffled ribbon, Island Indigo ink & card stock, Pool Party ink (sponged on oval) & card stock & ruffled ribbon, 1/2" Circle Punch, Oval Punch, Scallop Edge Punch, Baker's Twine, White Gel Pen, Crop-a-Dile, Brights button, Stampin' Dimensionals, Mini Glue Dots. I mentioned these new My Digital Studio Content DVDs in my New Catalog post, and wanted to follow up with the details on those, because they are such a GREAT deal, and because they were featured in a customer newsletter I just sent out! These DVD Collections are based on several Product Suites featured in the new catalog. Each DVD contains digital content from multiple Product Suites. This digital content is available to order and download online, however, when you order the content DVD, you get the content at OVER A 10% SAVINGS! That's why I created the flyer above--so you don't order digital downloads that you can get cheaper on a DVD. Mind you, they are physical product, so you will pay tax and shipping on them. But, if you are already ordering physical product on your Online Order, or you are looking to earn Hostess Benefits from guest order sales totals, these content DVDs are ideal. NOTE: Right now these DVDs don't seem to appear in the Stampin' Up! Online Store. UPDATE: You'll find these DVDs in the Digital Designing section of my ONLINE STORE, under the My Digital Studio Software category. There are over 450 digital downloads currently available for Online Order. Click HERE for a PDF LIST OF ALL AVAILABLE DIGITAL DOWNLOADS. CLICK HERE TO SHOP THE NEW CATALOG NOW! 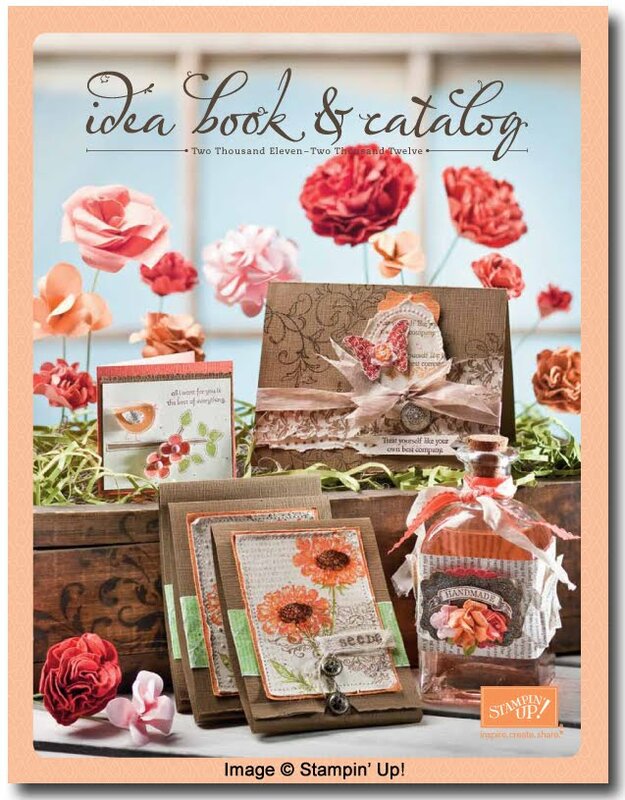 NEW 2011-2012 Stampin' Up!® Idea Book & Catalog! The Stampin' Up! 2011-2012 Idea Book & Catalog is HERE! You can right click on the image to download the catalog if you'd like, the file size is ~32MB. This is super, duper cool--you can choose from 4 bundled content DVDs, which contain digital art at over a 10% discount from the individual download prices! This is great news for Hostesses whose guests would like to purchase digital product, as the sales of these physical products will count towards sales totals. Speaking of Hostesses, this catalog marks the beginning of a new Hostess Benefits program where you purely get Hostess Dollars to spend on ANY product in current catalogs. There is a special Hostess section at the front of the catalog Hostesses can shop, with specially-priced exclusive products, which have been priced to give you a huge discounts. But, if you don't like any of those products, buy whatever you want with your Hostess Dollars! And, once your sales total reaches $400, you start earning your choice of any catalog item at 50% OFF, in addition to your Hostess Dollars. Check out page 9 of the new catalog for a handy chart, and see pages 10-15 for the exclusive Hostess product. The stamp set for this fundraiser this year is called Turtle & Co., and it's got the cutest little frog I've seen in a long time! Stampin' Up! donates $2 to RMHC for the purchase of each of these stamp sets. There are 14 Product Suites throughout the catalog, containing coordinating product to help you get a designer look to your projects. These collections are based on colors from each of the 13 Designer Series Paper packages, and 1 of the Specialty Designer Series Paper packages in the new catalog. You're sure to find at least one that will suit your tastes! Stamps, Stamps, and more Stamps! Of course, there are tons of new stamp sets that I just LOVE, but I'm going to feature those throughout the catalog year. I do want to point out, though, that we do have a few new products to augment the clear-mount stamp product line. There is a Clear Block Cleaning Cloth, some repositionable vinyl Guides you can get to use on your clear blocks, and some Clear-Mount Cling Foam you can use if you want to re-mount some of your own stamps! Our fabric line has expanded to include several designs which coordinate with Designer Series Papers in the new catalog, and a few previous designs have returned. Keep an eye out for the 2011 Holiday Mini catalog debuting in September, as I believe we will be getting some new Designer Buttons which will be great to use with these fabrics! I have to point out the new Cherry Cobbler Embossing Powder on page 201--this will be GREAT for all your holiday projects! I love Cherry Cobbler, both the food, and the color. Big shout out here for the Lace Ribbon Border punch...you'll find it on page 211 in the new catalog. WOW, tons of cool possibilities with this one. You can make border strips, or cut out the little lace medallions and use them separately. And, the Petite Pennants Builder punch is a must-have for small projects, and you can use the Perfect Pennants Bigz L Die for larger projects. This one isn't really a punch or die, but the Designer Frames Embossing Folder set on page 218 will make some absolutely fabulous highlights or embossed medallions on your projects! 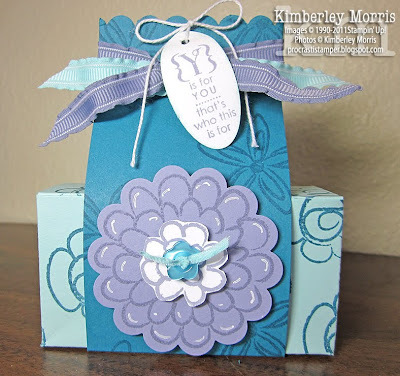 There's also a sweet little Blossom Box Bigz L Die and a Petite Pocket Bigz XL Die, which will be going on my first catalog order today. By the way, the Décor Elements and Stencils have been moved into the Idea Book & Catalog, so you'll find all those on pages 227-234. This will be super convenient, so you can view them in the same book as coordinating product. I hope that helps point out a few exciting new things you'll want to add to your craft supplies. Remember, the best way to earn FREE PRODUCT and get FREE CLASSES on rubber stamping, scrapbooking, paper crafting, and home décor ideas is to Book a Free Workshop with Me (your place in the Colorado Springs vicinity, or mine)! I also do free one-on-one consulting in my home if you'd like a try-before-you-buy experience.